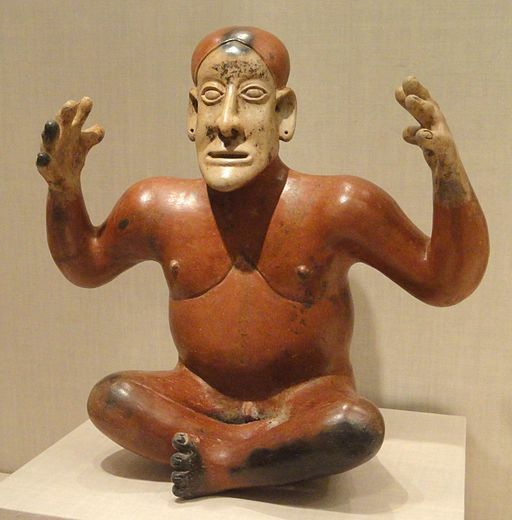 Pre-Columbian, Mexico. At Art Institute of Chicago. Public Domain. Yesterday, at the monthly breakfast meeting of the Sacramento Branch of the California Writer’s Club, someone asked what I blog about – an excellent question. Though it might not be obvious looking at eight years worth of posts here, it took only a moment to answer. One area of fascination for me is the way both modern physics and ancient Buddhist tenets agree that our seemingly solid and stable world is anything but. “Out there” we have only complex patterns of swirling light and energy. It’s the same “in here.” Our limited physical senses give us an illusory experience of a solid world, and we make up stories about it. Many of them deal with simple survival: red means stop and green means go; every part of the oleander is poisonous; if you face the rising sun, north is left and south is right. Of far greater interest are the stories individuals and cultures tell themselves about who they are, where they are, and what they are doing there. That’s where we get into trouble, by and large, as a glance at any newspaper will confirm. I’ve never forgotten the account of a young boy, a fan of The Six-Million Dollar Man, a TV show in the late 70’s, that told of an astronaut, badly injured in a crash, who received bionic implants during surgery, which gave him super-powers. The boy decided to jump off the roof of his home, thinking that if he hurt himself badly enough, he might get super powers. He lived, but spent a long time in traction. Stories have many different levels, literal and symbolic. Get that wrong and they can kill individuals, cultures, and as we are coming to see, entire species. Last night the sun, through a brown haze, was red when it set. This morning, through a brown haze, the sun was red when it rose. When we left the house at 7:15 to take the dogs for a walk, there was fine dusting of ash on the cars. Though Redding is 170 miles north, and Yosemite almost 200 miles south, there is no way to forget that California and much of the west is burning in what has become a year round fire season. The northern California fire chief said fires of this intensity are new, and sadly, appear to be a “new normal.” During a summer of worldwide weather extremes, the scientific community is united in saying climate change is not in the future – it’s here. At the same time several pastors have said that God is angry because California tolerates gay people. Let me repeat what I said earlier: stories have many different levels, literal and symbolic. Get that wrong and stories can kill individuals, cultures, and maybe our entire species. If they could talk, what would the lead lemmings tell their comrades when the edge of the cliff came into view? This entry was posted in Buddhism, Climate, Current Events, Health, Nature, News, Science, Stories and tagged Buddhism, Climate change, Culture, current events, Events, Nature, News. Bookmark the permalink. I absolutely concur. Humans consciously look for narrative, whether that narrative is told by other humans (the arts) or suggested by nature (the sciences). But it’s definitely in the interpretation of that narrative that so much can go wrong (as well as right). That’s a very interesting question. Within the past year, I read of an experiment with dogs in Hungary. Researchers trained a group of border collies to keep still in an MRI machine, and then tested their reaction to a number of spoken words. They discovered that these dogs had an average vocabulary of about 250 words! So the household pet probably understands more of our communication than we do of theirs! And though strictly speaking, it may be projection, anyone who has lived with a dog knows the range of expressions they have, from embarrassment, joy, love, shame, etc. Good post and food for thought. I worry about the narratives being encuraged in the current times. I love the Rukeyser quote. Very thought-provoking post, as usual. Thanks, Morgan. It was nice to see you at the meeting on Friday. Nice to see you, Rosi. I expect to be attending more of their events over the coming months.